At the northeast tip of Nova Scotia is a land of rugged ocean coastline, waterfalls, and pristine mountain highlands. Whales play in the waters offshore and bald eagles soar in the coastal breezes. 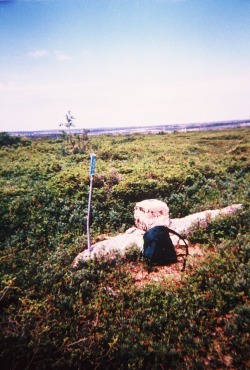 The highest point in Nova Scotia, White Hill, is deep in Cape Breton Highlands National Park, and no maintained trail leads to it. There is no similar highpoint hike in the US. There are two possible routes to White Hill – the Franey Mountain Trail and the Lake of Islands Trail. But the Franey Mountain Trail is actually an unmaintained fire road that was badly overgrown and hard to follow in 1997. The Lake of Islands Trail, although somewhat longer, is therefore recommended. To reach the Lake of Islands Trailhead, turn onto the Mary Ann Falls Road about 2 miles north of Ingonish, follow it north through forest about 3 miles, and turn left on a rutted road that lead to a small parking area. The first 8 miles of trail are well maintained. Just before reaching Lake of Islands, turn left on an old unmaintained fire road. After 4 miles turn right on another fire road heading west-northwest. White Hill will soon be visible on the left beyond White Hill Lake. At the highest point on the fire road, and due north of White hill, leave the road and bushwhack 0.5 mile through dense growth to the summit. Follow the same route in reverse to return to Lake of Islands and the Lake of Islands trailhead. The total round-trip distance is about 27 miles, of which 16 miles are on well-maintained trail. There is a backcountry campground at Lake of Islands, allowing the possibility of breaking this long hike into two or three days.